Great news! After a 2-year renovation of our 1925 Florida bungalow, ReWorked Creations interactive art gallery is now open in the Village of the Arts. Gallery hours are Tuesday-Saturday, 11am-4pm. 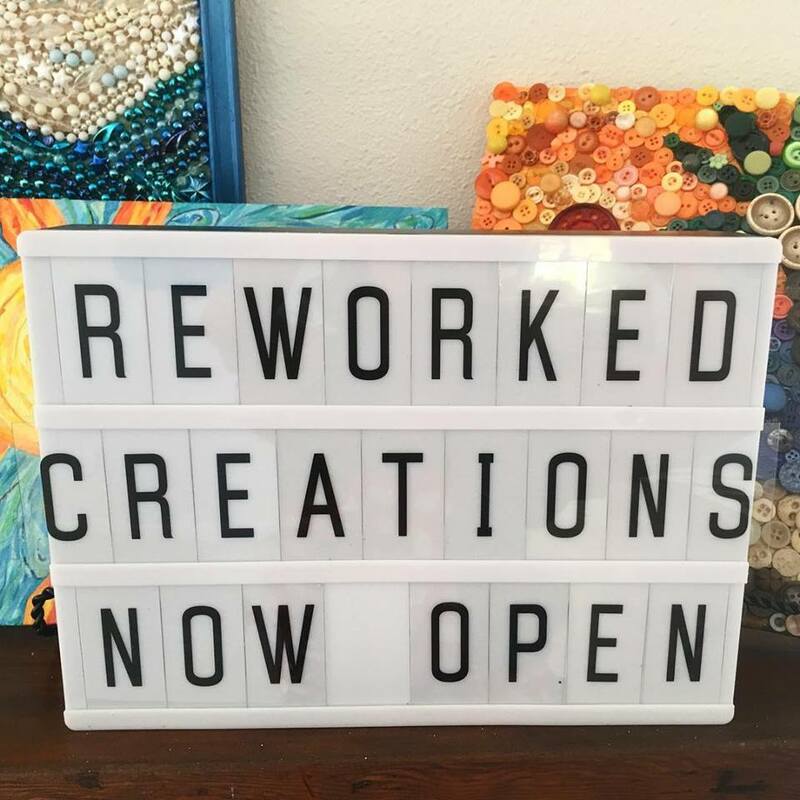 ReWorked Creations specializes in offering art created from a wide variety of reclaimed and repurposed materials including many different types of papers, maps, sheet music, buttons, broken jewelry, pallet wood, mardi gras beads, scrap fabric, egg shells, found objects and much more. In addition to hosting the work of several reuse artists, ReWorked Creations offers Make and Take programming in the form of Open Studio, classes and workshops. Check out our Make and Take page to find out more! What’s Happening at the Gallery this Week! Hello friends! We've extended our EcoFest sale through April 27. Buy 2, Get 1 Free on cards, cuttings, appliques, ornaments, beads, paper packs and repurposed parts. Stop by and stock up on some fab parts for your next mixed media project! It’s what inspires us to do what we do. Today was quieter than we anticipated at the gallery, so Lee and I experimented more with techniques for creating cityscapes with paint chip samples. We are developing a strategy and ultimately a class. These are some early examples and we’ve already switched up some of the techniques to compensate for problems we encountered. Creating equals learning! Free Make and Take today at ReWorked Creations during the EcoFest celebration in the Village of the Arts! Free Make and Take at ReWorked Creations during EcoFest! Stop in and make a paint chip cityscape. Lee will guide you through the process!